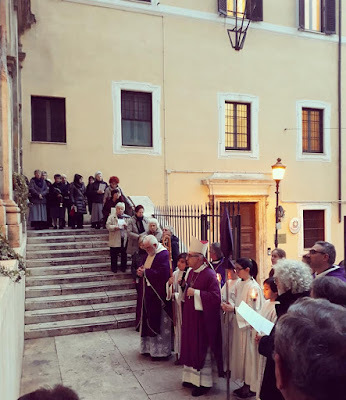 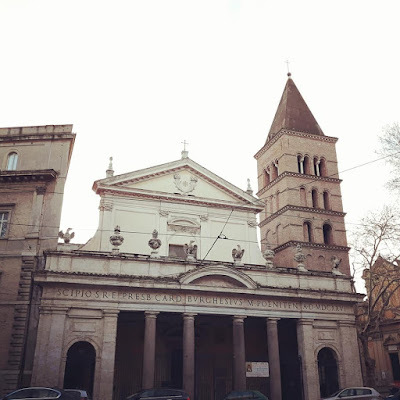 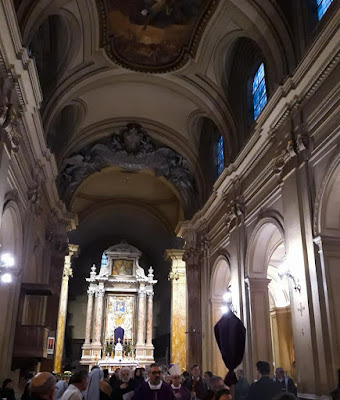 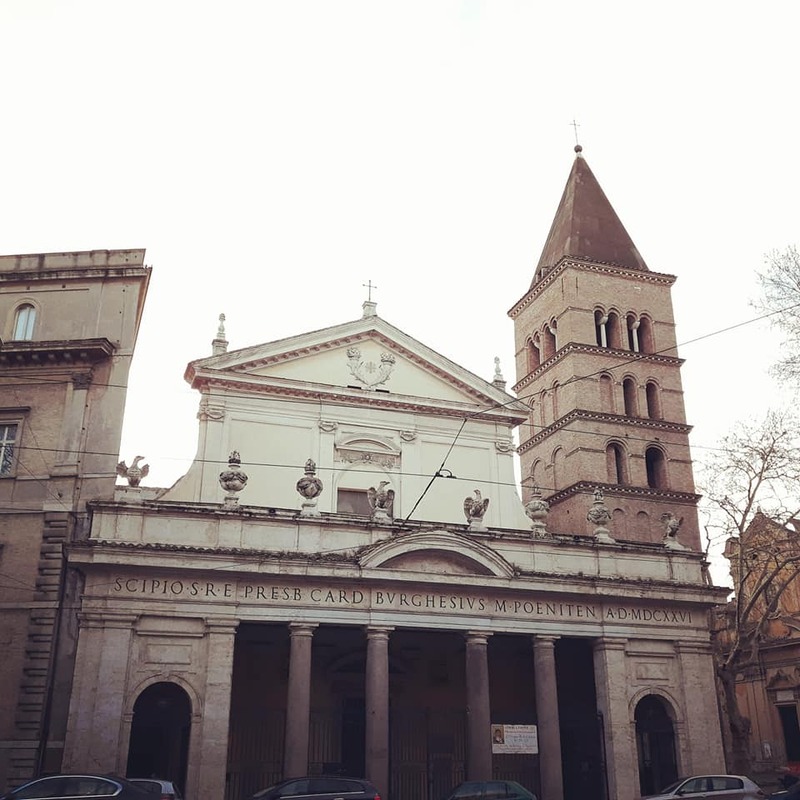 In the historical lectionary of the Roman Rite, this was the day on which the Gospel of the Raising of Lazarus (John 11, 1-45) was read; the station was therefore kept at the church of St Eusebius on the Esquiline hill, right next to a very ancient Roman cemetery. A very nice shot of a reliquary bust. 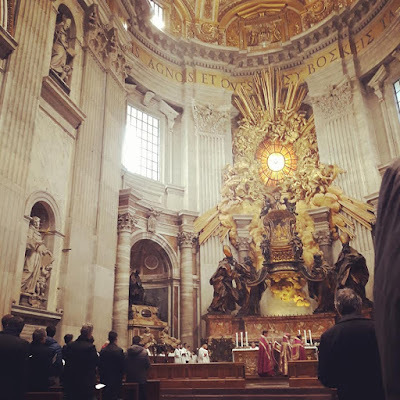 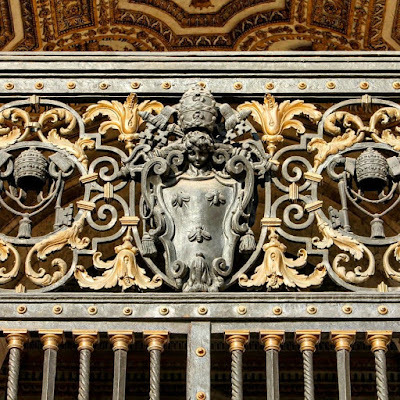 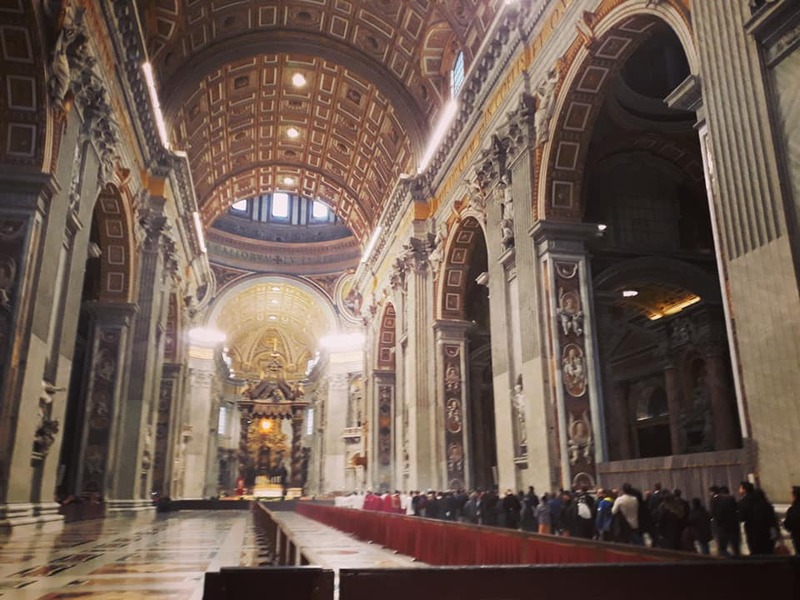 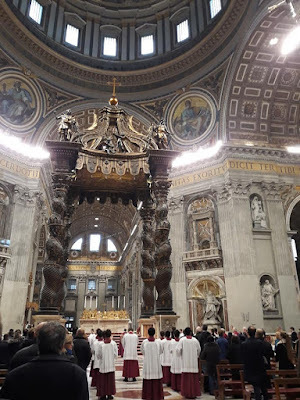 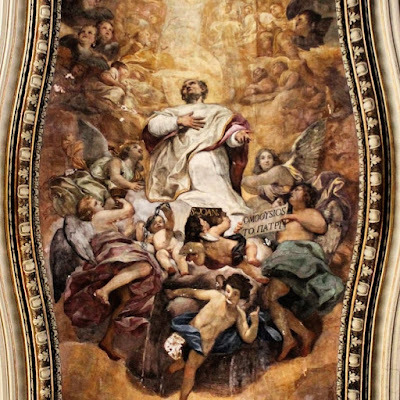 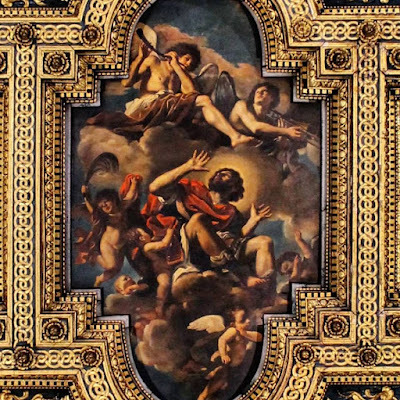 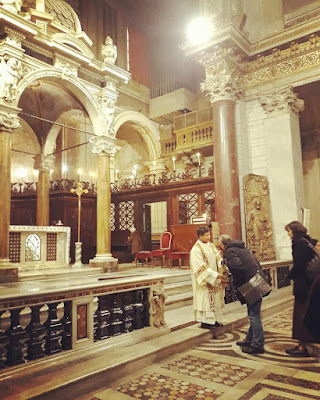 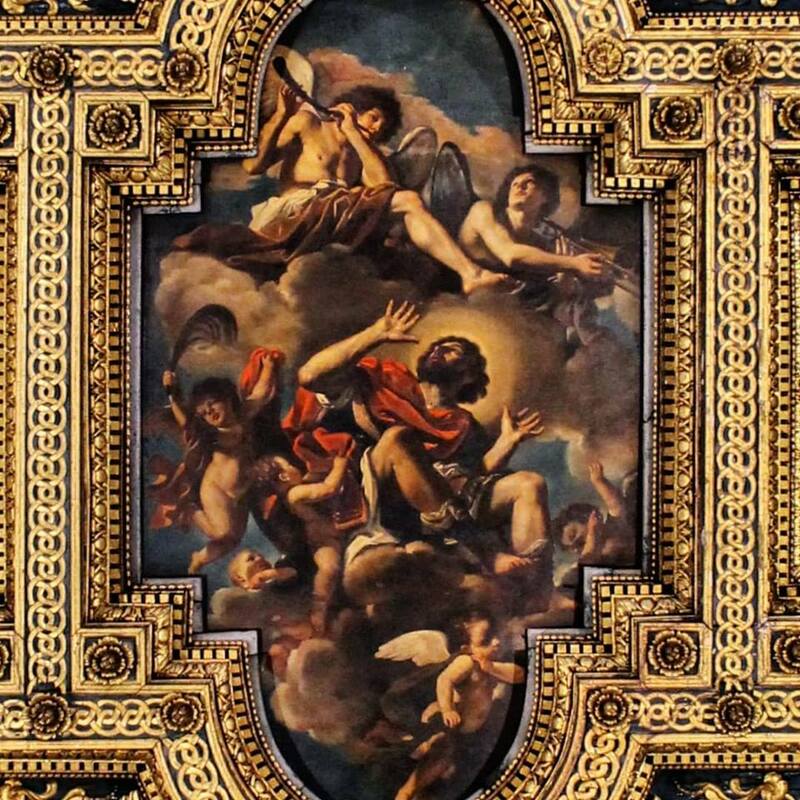 On this day, the chapter of St Peter’s Basilica celebrates Vespers with particular solemnity, after which the Veil of St Veronica is exposed for the veneration of the faithful from the balcony of one of the great pillars which support the church’s dome. 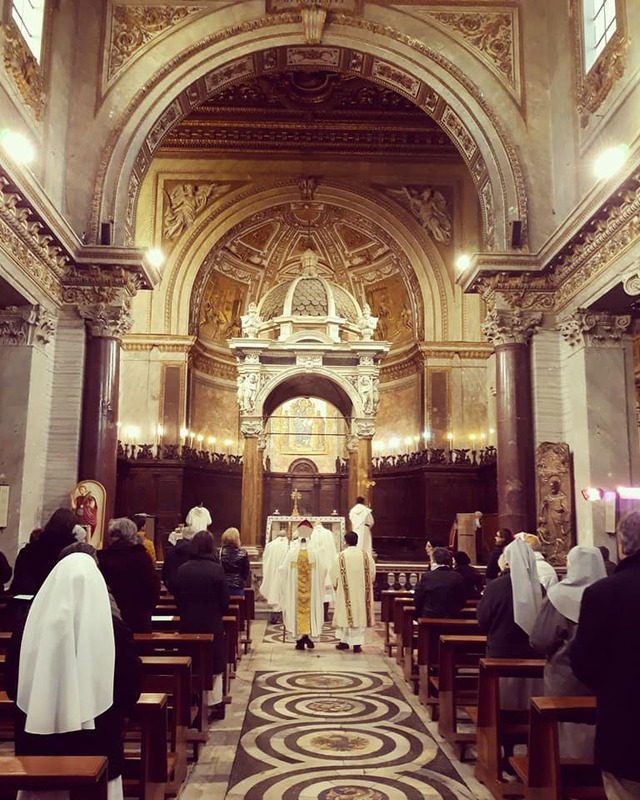 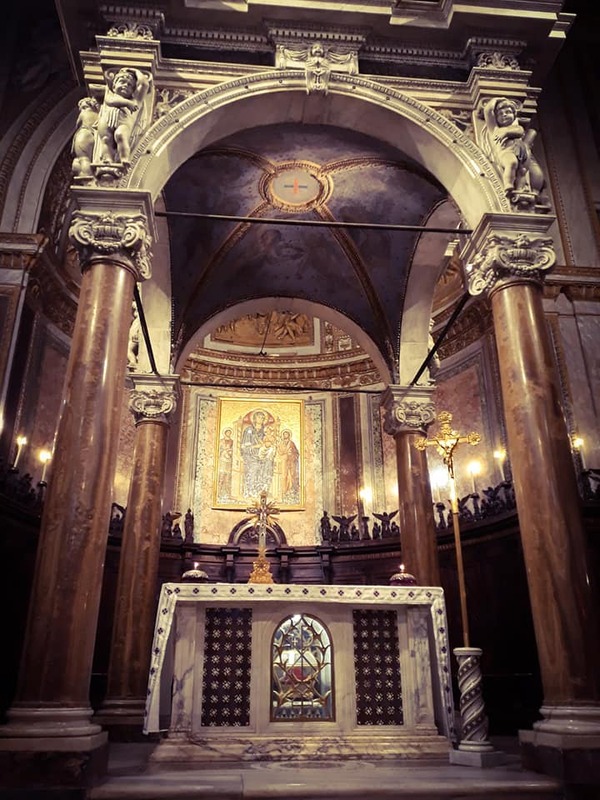 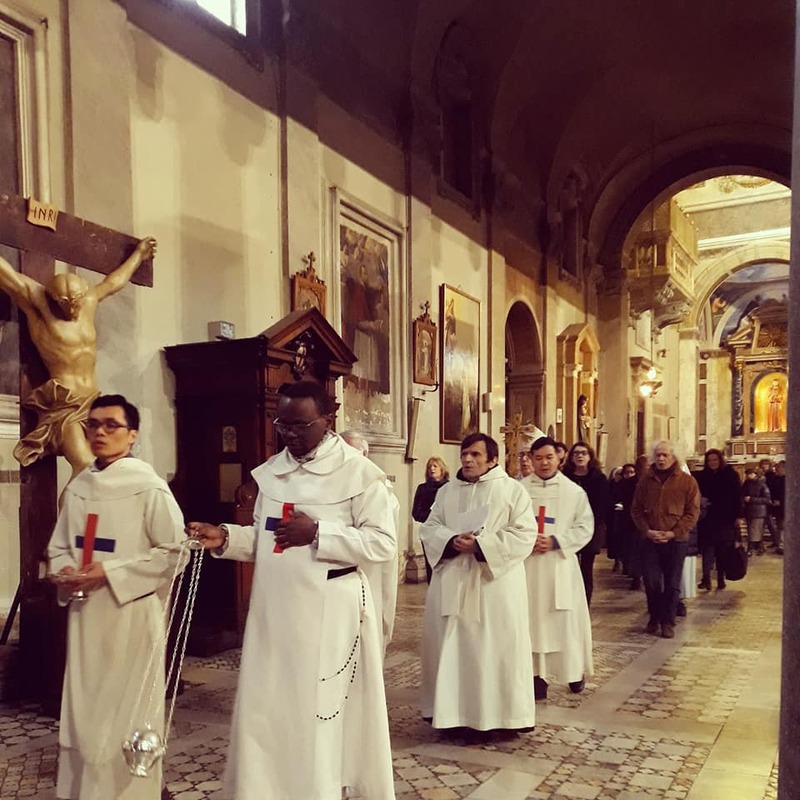 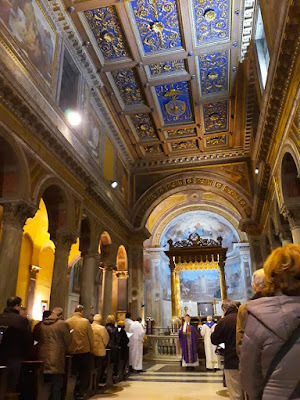 The procession is held entirely within the church, which is of course the largest in the world; the high altar is covered with relics, as also on the Ember Saturday of Lent, when the Station is also held here. 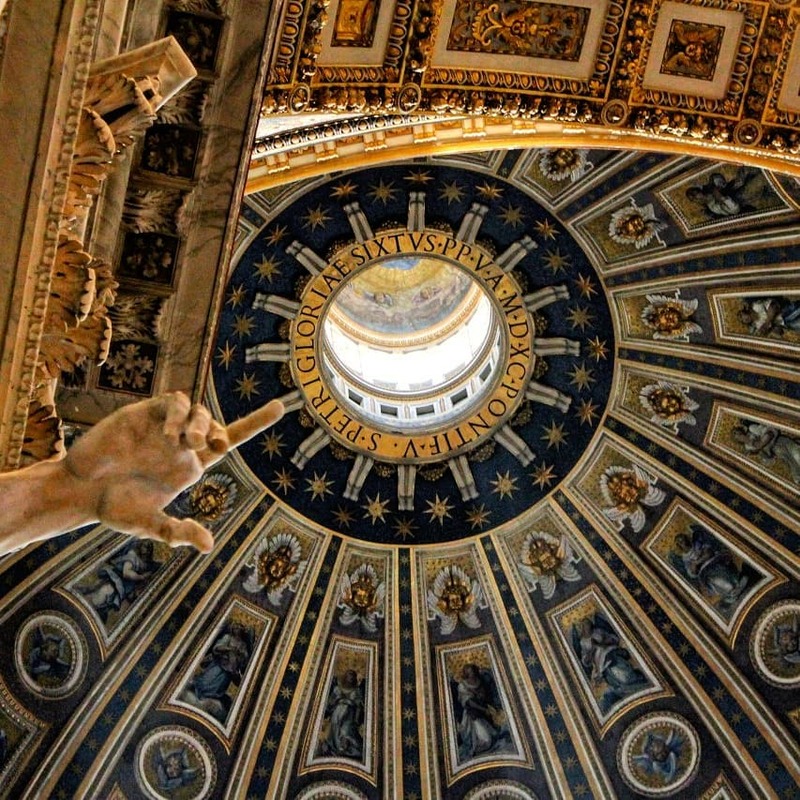 Another fantastic shot from Fr Alek: the hand of the Prophet Elijah seems to point to God the Father at the top of the cupola. 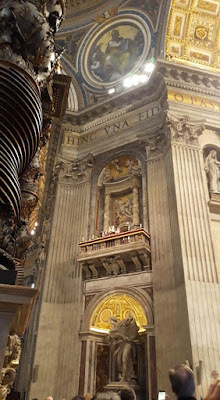 The pillars of St Peter’s, including those of the enormous apse, have statues of the founders of various religious in their niches, with Elijah among them as the traditional founder of the Carmelites. Relics are displayed on the high altar for the church’s two Lenten stations, Ember Saturday and Passion Sunday. 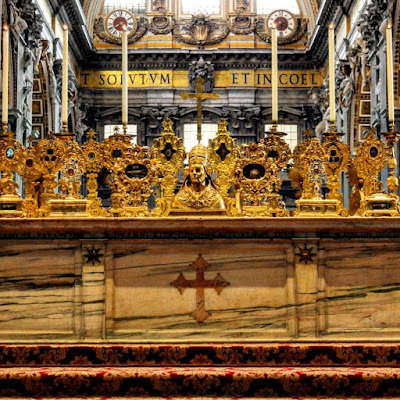 The relics of martyrs are placed closer to the edge of the mensa, and those of other Saints further in; the four corners are decorated with reliquaries shaped like obelisks, with long bones (tibias and such) in them. 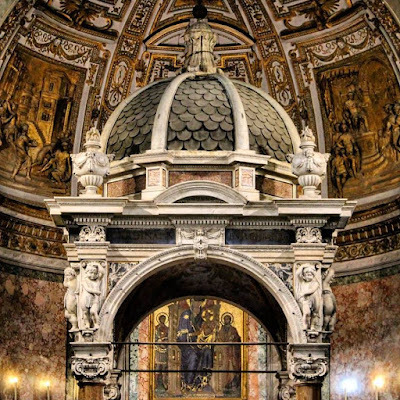 Two rectangular panels are set one on each short side of the mensa, each containing relics of 35 Popes, between the two of them, all of the Sainted Popes except the most recent. 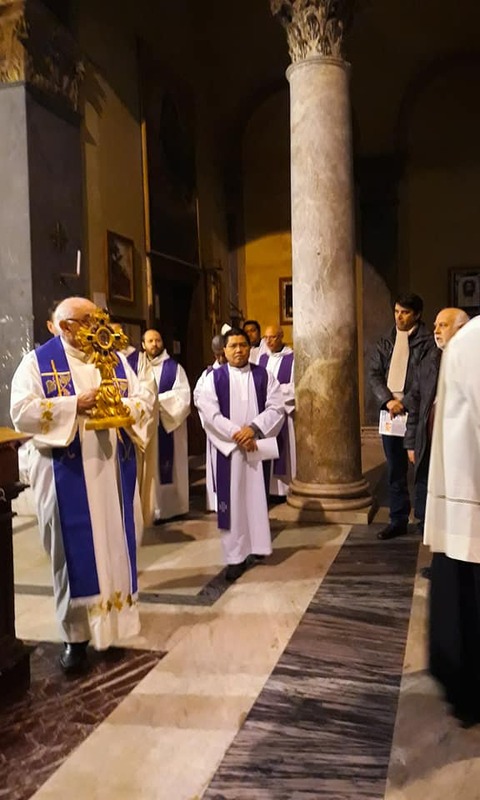 On the long side facing the apse, a bust reliquary of Pope St Damasus I (366-84, feast on December 11), containing the relics of his skull, is placed in the middle. 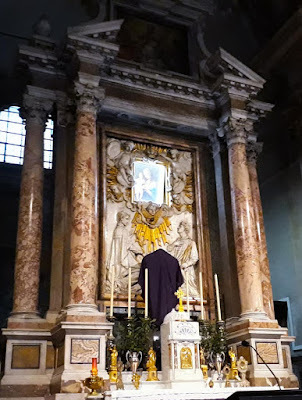 This is a particularly appropriate choice, since he was a great promoter of devotion to the Saints and the cult of the relics, particularly those of the Roman martyrs. 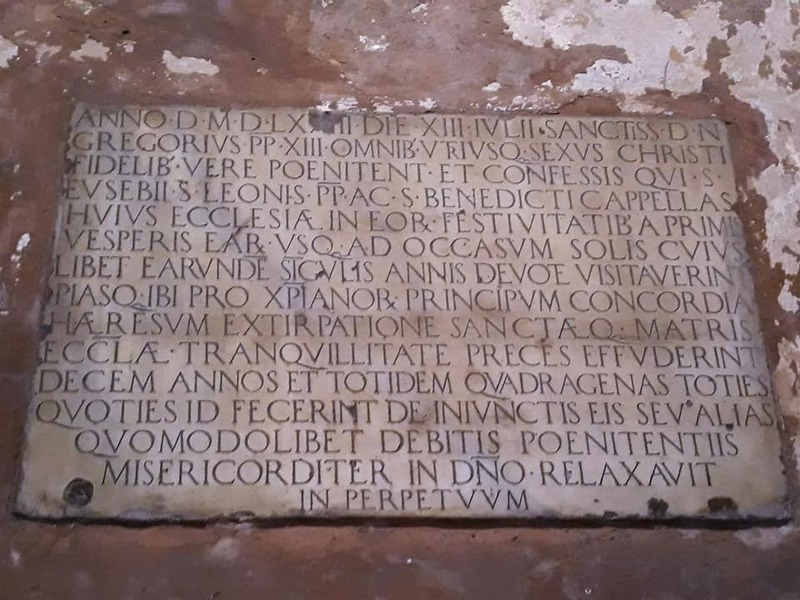 Within many catacombs, he rearranged the spaces around the tombs of the martyrs to make it easier for pilgrims to find and visit them, and decorated the tombs themselves with elaborately carved inscriptions written by himself in classical poetic meter. 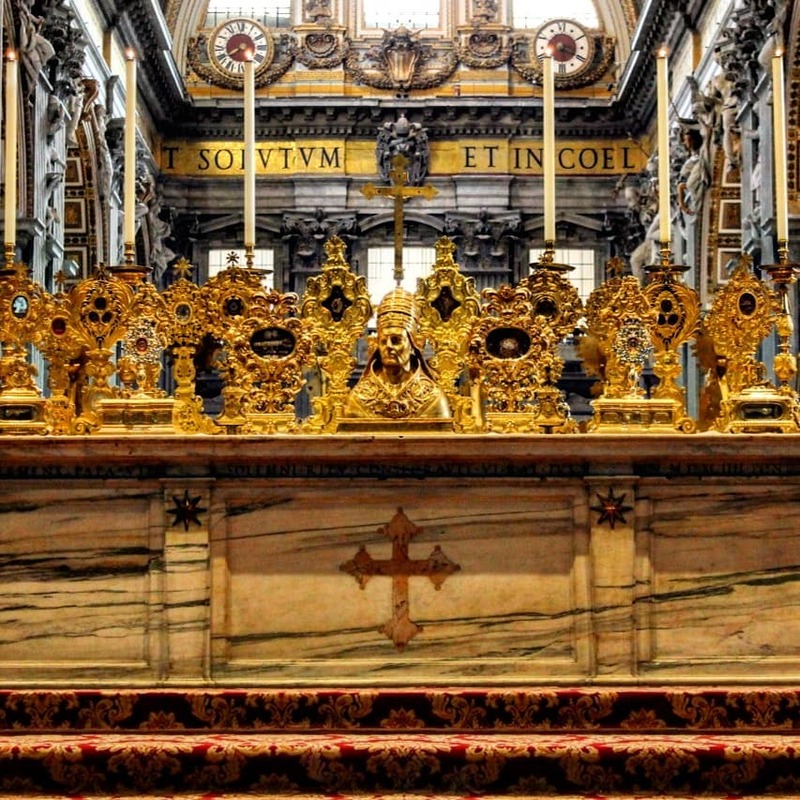 For this reason, he is honored as the Patron Saint of archeologists. The church is in the care of the Trinitarian Fathers, one of the medieval ransoming orders whose mission was to rescue Christians captured and held as slaves in Muslim lands. 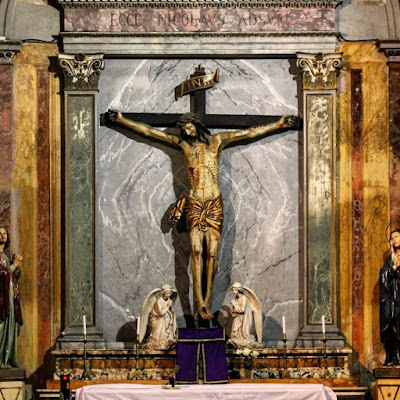 The red and blue cross is traditionally said to have been divinely revealed to their founders, Ss John of Matha and Felix of Valois, as their distinctive symbol . From Fr Alek: St Chrysosgonus, a Roman martyr of the 4th century, glorified as a martyr in heaven. 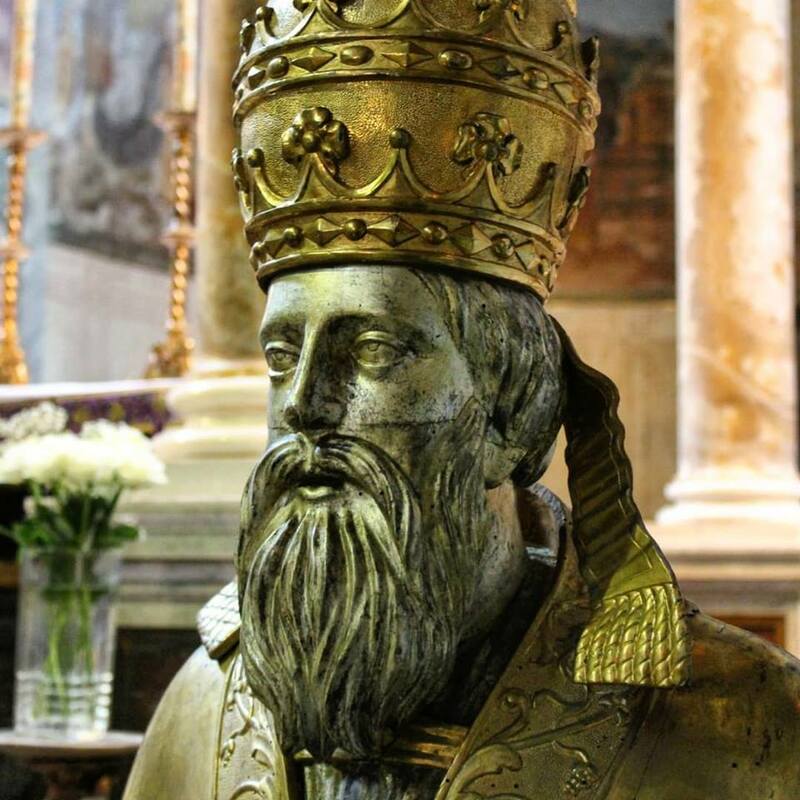 His traditional legend is considered historically unreliable, but he was one of the most venerated Saints of the early church, and is named in the Canon of the Mass. 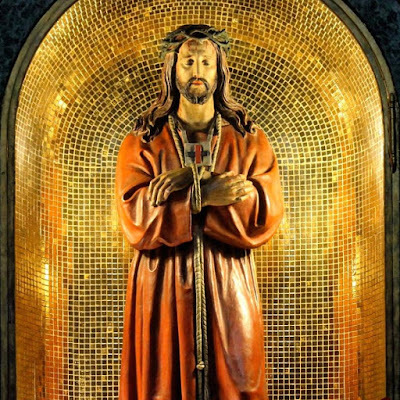 A statue of the Redeemer wearing the scapular of the Trinitians.